Automatic 5 Gallon Decapper/Lid Remover---The decapper was used for decapping the cap from used 5 gallon barrel. The lid removing process is automatic. The 5gallons bottle was put on the conveyor and the empty bottle will goes inside the de-capping machine. 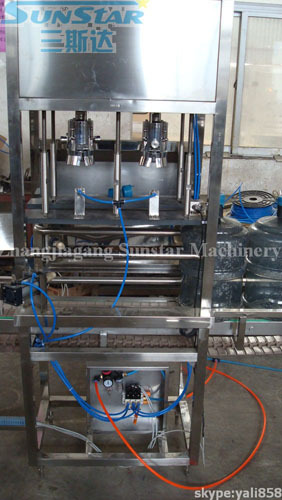 While the bottle come inside the de-capping machine, photoelectrical will send the signal to PLC, PLC will instruct de-capping cylinder and barreled hold Cylinder to make the up and down action. And let the de-cap head catch the cap, and let the barreled leave the conveyor chain, and also under instruction Of PLC, barreled raised up. after the cap removed by the de-cap head, the head will opened, this time the huff device work, will put the cap inside the Collector.